Carboxymethyl Cellulose Market Size will surpass USD 1.7 billion by 2024; according to a new research report by Global Market Insights, Inc.
Carboxymethyl cellulose market (cellulose gum industry) growth will be driven by the escalating demand trends from the food & beverage segment. The product will have robust demand in the processed food formulations for various roles as: adhesion agent, thickening agent and stabilizer, emulsifier, bulking agent, firming agent, gelling & glazing agent, humectant, etc. WHO estimated that 39% of people aged 18 and above were overweight in 2016 and 13% were obese. In the same year, about 41 million children under the age of 5 were identified to be overweight or obese. Rising desire for food products with natural ingredients along with the increasing obesity levels have been boosting fat replacers demand in the recent years, which in turn propel CMC market size by 2024. Rising demand for crude oil and natural gas has been encouraging exploration companies to engage in extensive drilling activities. Carboxymethyl cellulose used in drilling mud balances various physical parameters such as adjustment of viscosities, reduction of loss of water and increase of thixotropy. Cellulose gum market will feature robust demand from oil & gas applications over the forecast timeframe. Increasing threat for product from various internal and external substitutes in different applications might pose as a restraining factor for the carboxymethyl cellulose market by 2024. Hydroxypropyl cellulose, carrageenan, xanthum, pectin, microcrystalline cellulose, guar gum, ethyl cellulose could be preferred as an alternative to the product by the product end-users by 2024. CMC having purity (active ingredient) above 95% held the highest share exceeding 40% in 2016 and will follow the similar trend by 2024. The carboxymethyl cellulose market growth will be ascribed to the high demand for cellulose gum with purity more than 99.5% from food & beverage and pharmaceuticals applications. Personal care segment is expected to have growth exceeding CAGR 3% in the overall CMC market by 2024. Product utility in this segment has been in the: skin care products including: cosmetics, sunscreens, body lotions, etc. ; hair care products such as: shampoos, gels, hair conditioners, etc. ; oral care products including: denture adhesives, toothpastes, etc. Another trend in personal care sector has been the cellulose gum based superabsorbent polymers (SAP) for their usage in diapers and other fluid-absorbing products in the recent years. Carboxymethyl cellulose market has been grabbing attention in scientific and agriculture fields, for its biodegradable features and high swelling capacity. 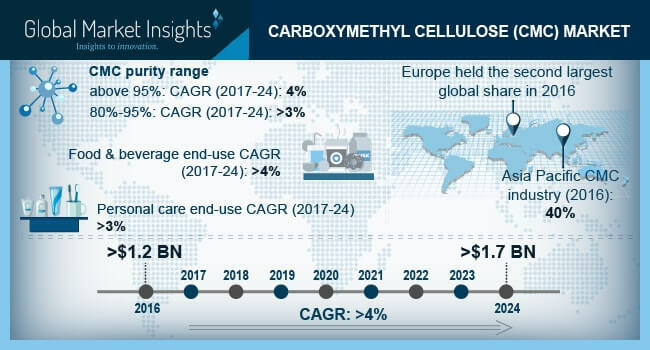 Carboxymethyl cellulose market demand in pharmaceuticals segment are expected to observe growth close to 4% CAGR by 2024. The product has been observing acceptance in this sector as an inert non-pharmacologically active ingredient on account of its ability to provide improved drug dissolution and disintegration characteristics. The product is also used as a granulation aid & binder in tablet coatings, and as a stabilizer & thickener in ointments, lotions, etc. Following Asia Pacific, Europe was the second-largest region for carboxymethyl cellulose market in 2016. Product demand for was led by personal care and food & beverages industries. Product demand was dominated by countries such as Germany, France and the U.K. due to high demand from personal care and food and beverages industries. Key industry players in the fragmented carboxymethyl cellulose market have been: Ashland, Nippon Paper Industries, USK Kimya A.S., Daicel Corporation, Patel Industries, Qingdao Tianya Chemical Co. Ltd., etc.